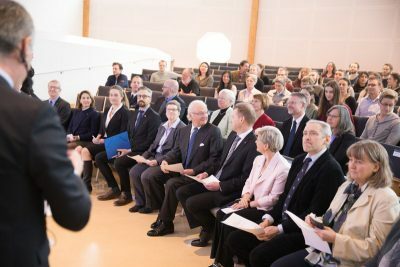 Canadian Scientist Dr. Derek Muir, the twenty third holder of King Carl XVI Gustaf’s Guest Professorship in Environmental Science, gave his introductory lecture on March 13th, to an audience of distinguished guests including His Majesty the King of Sweden, and Canada’s ambassador to Sweden, Heather Grant. Professor Muir is among the world’s foremost environmental chemists. His work focuses on the effects of organic and inorganic pollutants, especially in the Arctic, as well as the development of methods for identifying and monitoring new environmental pollutants to map their global emissions. The findings from his studies help policymakers regulate the production and use of harmful chemicals to, eventually, replace them with environment-friendly alternatives. 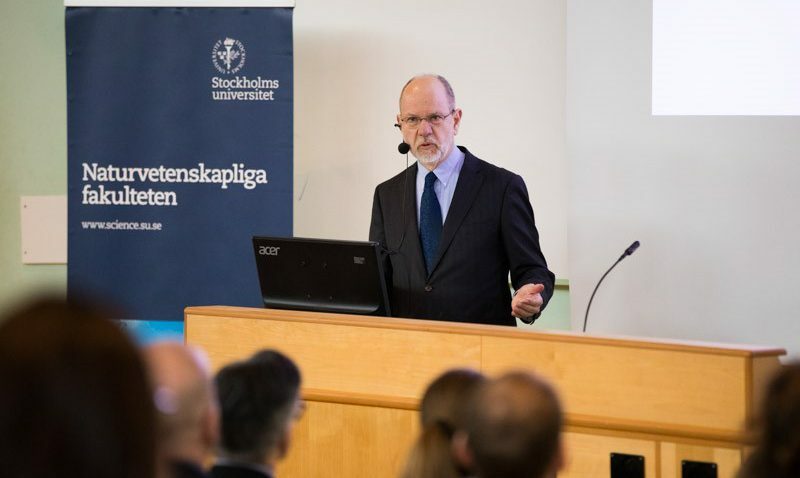 During his time at Stockholm University, Professor Muir has focused on how climate change affects the transport of environmental pollutants to Arctic regions via the atmosphere and ocean currents. In his talk, he highlighted the importance of collaborating with indigenous communities in the Canadian Arctic that have been exposed to these harmful pollutants through their traditional diets. His work has helped these communities reduce their exposure by switching to alternative foods. Professor Muir’s talk was contextualized by Matthew MacLeod and Anne Sörensen from ACES who discussed emerging environmental pollutants and their environmental impact, and how mercury, in particular, is being released to the environment as the Arctic becomes warmer. Vice Rector of Stockholm University Claes Hättestrand and Professors Jonathan Martin and Cynthia de Wit from ACES opened the session with a brief introduction on Professor Muir’s career and achievements, which include contributions towards global bans on a number of brominated flame retardants and perfluorinated chemicals such as PFOS. “Derek is one of the co-leads of the Persistent Organic Pollutants, or POPs Expert Group under the aegis of the Arctic Monitoring and Assessment Programme, or AMAP. In that role he has helped produce four major assessment reports for AMAP about POPs and new chemicals in the circumpolar Arctic. The results of the first assessment report were crucial to creating the POPs protocol on Long Range Transport of Atmospheric Pollutants Convention in 1997 and the United Nations Stockholm Convention on POPs in 2001,”noted Cynthia de Wit during her talk. The Long Range Transport of Atmospheric Pollutants Convention and the United Nations Stockholm Convention regulate a number of POPs such as PCBs and DDT, both regionally and globally. The session was moderated by Johan Kuylenstierna, Head of the Stockholm Environment Institute and Adjunct Professor at Stockholm University.